The other two Doc Savage magazines have turned up and these are in much better condition. The first is Dagger In The Sky. I’ve not read that; and flipping through the magazine there’s an editorial where they mention the next issue’s feature: The Other World. By coincidence I’ve just finished reading the paperback edition of that. There’s only the one other story in this issue, the novelette Formula for Death by George L Eaton. Overall both magazines seem fairly robust. In comparison to the first one I bought: I’ve just started reading the story, The Motion Menace, and the magazine starts to fall apart. Odd that it deals with aircraft at the start of the novel and it’s mentioned that crashed flights were blamed by the early airline industry on sabotage and terrorists by the PR departments of airlines. Damn. Terrorists mentioned in 1938. The war on terror has been going on longer than we thought. The second magazine received, the Jan 1941 issue is the same: one novel and one supporting story, Caldron of Confucius (sic, although the actual story is spelt correctly) by Joseph H Hernandes. The Doc story is The Devil’s Playground. I have read that but I gave away/sold the book ages ago. I remember it was one of the double novels I bought in Edinburgh way back in the eighties. I also like the drawings in the magazines, it shows Doc as a man and not some sort of superhero in ripped clothing like the paperbacks do. 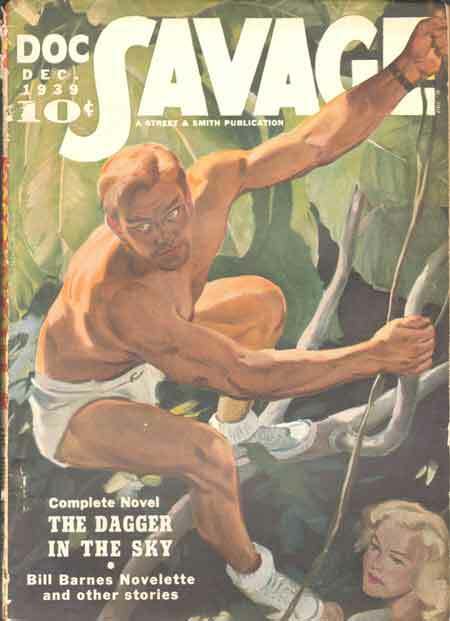 Also, among the ads scattered through the magazine, something I didn’t know: there were Doc Savage comics issued at the same time. This issue (Jan 1941) advertises the Frozen Terror plus a full colour story about Alex the Sun-Man.